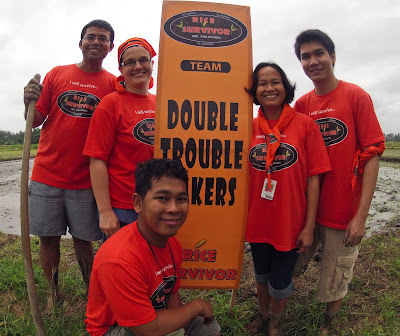 Early on in Rice Survivor it was widely assumed that "Team Double Trouble Makers" got their name from their curiously partitioned paddy. But as they began mechanical transplanting of plot 826 it became clear that their moniker reveals much more! Last Tuesday, 8 Jan, Team Matatag pulled our seedlings from the modified wet bed nursery. I think we were all expecting this to take about half hour. After this expected time elapsed, our team plus Katie and Nicola had pulled seedlings from an area of about 1 sq meter (or maybe 2) at the most. The seed bed was perhaps 20 sq meters and we were initially planning to get about half of it. We started to realize we might be there till dark or beyond. We watched the team of kabesilya workers in the adjacent plot as they pulled seedlings hand over fist. Pretty soon, members of our group were shouting, "Help!" so the kabesilya workers might hear and have pity on us. Perhaps this worked, or more likely it was because Bert, a field superintendent, felt pity on us and started to help. In about 10 or 15 minutes, the seedlings we needed were pulled and bundled. We left them within the protection of the nursery area overnight. On the next morning, Wed 9 Jan, the plot was marked when I arrived. By 8, our team was assembled, the seedlings had been delivered, and we were heading into the mud with bundles of seedlings in hand. It took maybe 30 minutes before I developed any sort of rhythm (I'm sure nothing resembling rhythm to a casual observer). I was covering about 6 rows to start and this number was growing as I was on the end and the plot wasn't square. Soon I was trailing the rest of the group but the important thing was that we were slowly progressing. 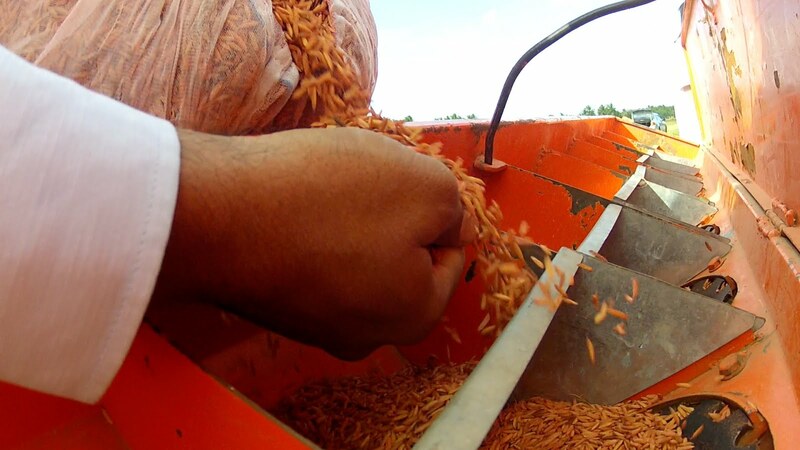 By 9:30 or so, about 1/4 of the plot was transplanted which seemed pretty good for a group of novice rice transplanters. Fortunately, 3 kabesilya workers arrived and had made one pass back and forth already. Because of them, our plot was finished before lunch. In looking over our work, I had the brief thought that our taller seedlings planted 1 or 2 per hill might give a slight advantage over the shorter seedlings of Team 2 - who had transplanted a couple days ahead. On Friday eve 11 Jan, the rain started falling. When I arrived to check on our plot on Sat morning, the plot was a pond of water. I opened the drain plus the rat hole serving as an auxiliary drain. As I started going around the plot, I could see snails everywhere, attached to our frail looking seedlings. I waded into the mud and started pulling snails on sight but I soon realized I was one against an army of hungry snails - a discouraging realization. After an hour of tromping around, trying not to do more harm than good, I had a kilo or two of snails in my bag - and this from less than a tenth of the plot area. 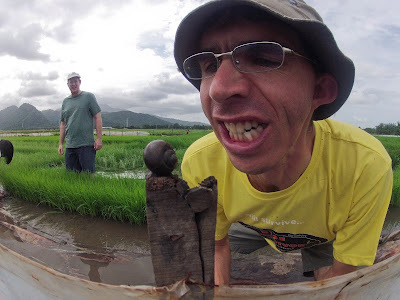 While I had changed the outcome of a few snails, our rice seedlings were looking pretty small and frail against this formidable foe. My fears were realized when checking the plot on Monday morning. In low areas where water had pooled, rice seedlings were sparse or nonexistent. The snails had enjoyed their weekend fiesta and Team Matatag was going to need to do some transplanting. On Tuesday, our team returned to our sizeable seedling nursery and discovered only 2-3 sq meters of seedlings remaining. At first glance, it appeared that none remained. What happened to our seedlings??? We gathered what was left and headed to 825. It was hard wading into the mud and seeing so many bare places. A handful of seedlings dwindled quickly when filling these sparse areas. While there are more spaces for seedlings, hopefully our replanting efforts will pay off. Anyone looking for a kilo of snails??? In the end, Team 2's shorter seedlings w/ several seedlings per hill, and also Team 3's plot that was mechanically transplanted on Friday before the rains, withstood the snail onslaught better than ours. I guess the extra seedlings per hill were more meal than one or two snails could take on. One or two nice seedlings per hill may appear to be a best bet, but that can change quickly depending on the situation and timing. For Team 2 - this morning Adam and I looked at our plot (824) for any signs of snail damage. There was a small area on the far side near team 1s plot in which snails had destroyed some plants. Adam is going to organise some 222 seedlings and I will replant this evening. The golden apple snail is new for me. 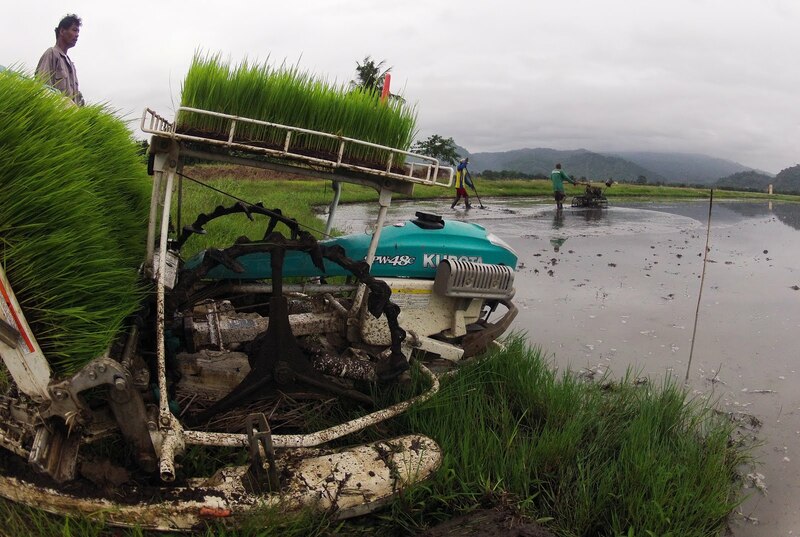 The practice in Bangladesh was to allow standing water immediately on transplanting. There was no golden snail there. For treatment we have chosen to use drainage. As a group we have opted here for non chemical control. Adam feels we will need irrigation by Friday as there is now some soil cracking. Is it possible to get the AWD circles to insert into the field now so that we can monitor the water level? Our challenge will be the behavior of the snails after the irrigation. Guys do keep on eye on the snails!